Acne occurs when your pores become clogged. Although the most well-known spot for acne is the face, it can also appear on your shoulders, back, upper arms, neck and chest. Many teenagers have acne, as it is one of the most common signs of puberty, however, adults can be plagued with it as this skin condition seems to have no age limit. There are many different types of acne, and all can appear at various times, or even at the same time on the same person. Blackheads, whiteheads, pimples and deep cysts and nodules are all forms of acne. 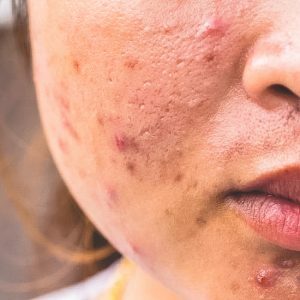 Thankfully, acne is more annoying than life-threatening, and dermatologists as well as physicians have a large “arsenal” of skin care products available to help clear up your skin. Some of the downsides to acne include self-esteem issues (especially in teenagers), and permanent scarring, no matter the severity of the acne. This term refers to a plugged or clogged pore. Your skin is full of tiny pores; some people are simply born with larger pores than others. When these pores become clogged with things like dead skin cells, bacteria, microscopic hairs and oils produced by the skin, they cause acne to form. Blackheads are clogged pores with a blackish appearance; these types of comedo are “open” because the blockages can easily be extracted. Whiteheads are called closed comedo, because you cannot see the blockage causing them; the skin around them closes them up. No matter what, blackheads and whiteheads should not be picked open or squeezed, as this can cause scarring and could spread the bacteria around to nearby skin, resulting in more clogged pores. However, a dermatologist or physician can extract the material that is clogging your pores using professional methods in a sterile location. A lesion that is less than 5 millimeters in length, diameter or width is called a papule. Papules are solid lesions that you can feel above the surface of your skin. They are a form of acne that may not be seen with the naked eye, but can be felt if you touch them. You’ll know if you have papules because the section of your skin affected by them will feel slightly like sandpaper. Pustules are lesions that are dome-shaped. They are filled with pus that is made up of a mixture of bacteria, dead skin cells and white blood cells. At times, they can have hairs at their centers. If you have a pustule you may use a comedone extractor to empty the lesion. A nodule is a type of acne that can be either irregularly-shaped or dome-shaped. They are solid, and are caused by inflammation, making them more destructive than regular acne lesions. Nodules can cause tissue destruction because they deeply extend through several layers of skin. On top of this, nodules can hurt, and are usually only cleared up by isotretinoin. When an acne lesion heals, it leaves behind a red spot. This red spot is called a macule, usually temporary but sometimes can be permanent. Macules are flat (not raised), have well-defined borders and can be any shade between red and red-pink. While they are sometimes temporary and disappear without a trace, macules can last for several weeks and leave permanent marks as well. The trademark “inflamed face” of many acne sufferers has a lot to do with having many macules at one time. Cysts are similar to pustules in that they contain the same mixture of bacteria, white blood cells and dead cells. However, they are much larger and extend deep into the skin like nodules. Also like nodules, cysts are painful and can cause tissue damage and scarring. Often the two (nodules and cysts) occur at the same time, forming a type of acne known as nodulocystic. As with nodules, the only effective treatment for this skin condition is isotretinoin. Acne is something that can affect anyone, regardless of age, race or gender. It usually occurs in those between the ages of twelve and seventeen. Some people have acne that only flares up occasionally, while others have more persistent cases. For the majority of people, acne vanishes by the time they reach their 20s, but for some people, this skin condition can last for several more decades. It isn’t unusual for people to have acne in their 30s and 40s, or for people to be lucky enough to survive their teenage years without it, only to have it appear once they are in their 20s. Despite the seeming equality of acne sufferers, there are a few differences. Severe forms of acne tend to occur more often in young men, while young women are more likely to have acne with a hormonal cause that is related to their menstrual cycle. Acne treatments vary widely, and depend on the severity of the acne and the age of the sufferer. In order to determine the best treatment for your skin, contact Dr. Price. He may suggest a combination of prescription drugs like Accutane or Retinol, over-the-counter skin care lotions, cleansers and creams, or laser treatments.